Ten years ago I posted on my Facebook Modern Homes Page the photographs of this modern home architect Rick Joy designed for a Dallas client. Recently, Rick Joy, FAIA, came to Dallas as the speaker for the Frank Welch Dallas Architecture Forum lecture. It was fun to hear Rick Joy speak about his work approach and philosophy about architecture, which in many ways coincided with the values of Frank Welch. It was also interesting to hear Rick Joy talk about this modern home that he designed for a Dallas patron and client in Arizona. It was a major work and expensive project, and a beautiful house that had a major impact on Rick Joy’s architectural career and future work. National and international architects have had a major impact on Dallas, as Dallas clients have invited them to design a home in Dallas. 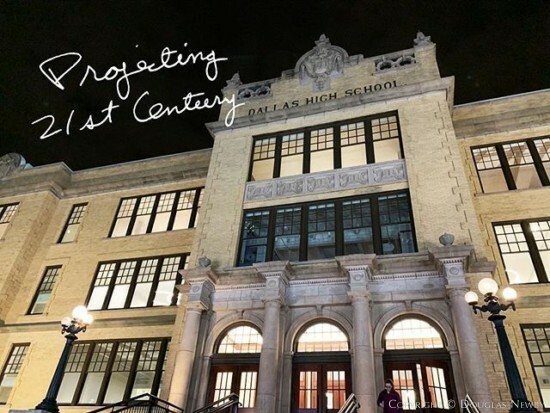 Dallas residents have also had a major impact on the careers of Dallas architects and architects across the country, as these architects are retained for second homes in beautiful locations on dramatic sites across America. Max Levy in 2018 designed three bedrooms to be added to the Steven Holl designed Stretto house. Each bedroom has its own screen porch breezeway. In addition, each bedroom has a cylindrical glass skylight, with a “light sail” shading device mimicking clouds as the sail can be revolved in position to diffuse the sun from its current position. This Max Levy detail allows one to connect with the sky and with the passage of the sun. Architect Max Levy, over his career, has explored the design of new houses in the city and the country. Max has explored renovation and extending the original architecture of period homes. 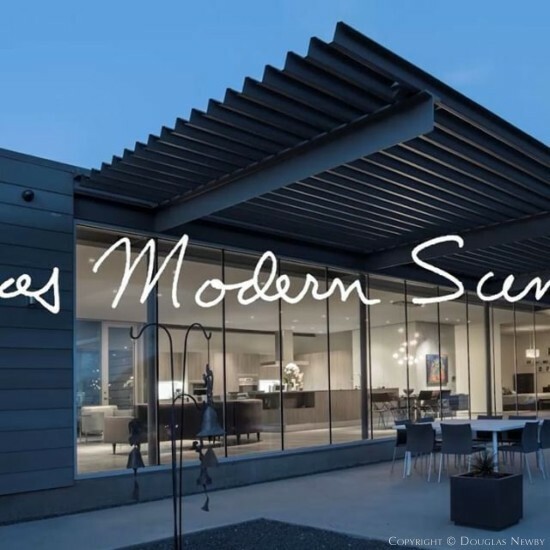 This modern home is one of Max’s most interesting architectural explorations. 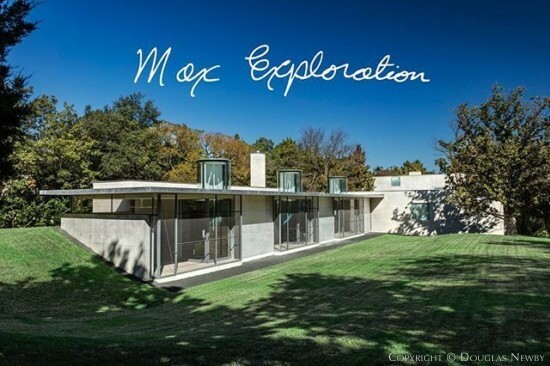 Max was presented with an architecturally significant home designed by New York architect Steven Holl 25 years ago on a beautiful creek-framed lot in Preston Hollow. When one thinks of architecture as art, this lyrical modern house quickly comes to mind. Even 25 years ago the very specific floor plan of this modern home created some day-to-day challenges. 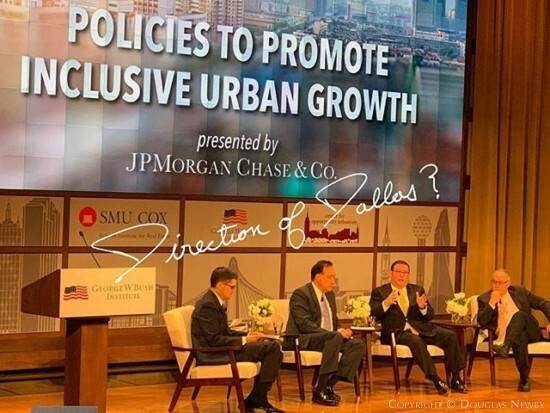 Twenty years later the challenges became even more acute. Max Levy in 2018 approached this home with both confidence and deference. Slender light-filled additions knife through the substantial acreage of this site, preserving and contrasting with the swooping and soaring spaces of the original home. A female artist maybe appreciates the hard work, good work, important work, and daily chores of the governesses, maids, and other domestic workers serving the middle class families. 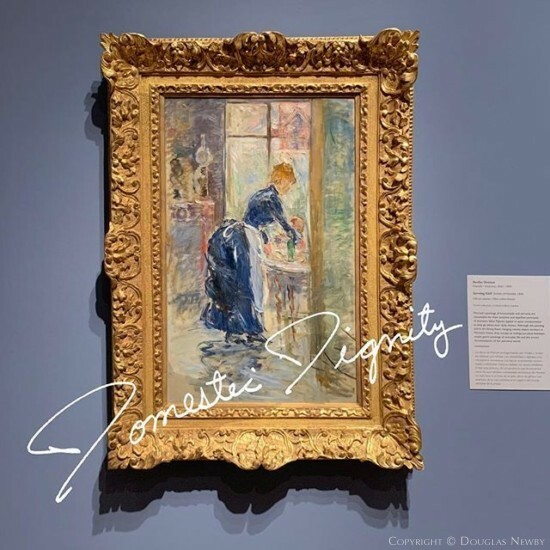 One gallery of the Berthe Morisot show at the DMA presented paintings depicting the hard work of these women with elegance and almost reverential dignity. I have always loved Impressionist art growing up going to the Art Institute in Chicago. My interest was further enhanced in Dallas by the presence, expertise, and knowledge of Rick Brettell, and of course the wonderful private Impressionist collection of Margaret McDermott. Usually my first stop in a city would be to see their collection of Impressionist paintings. Most of these museums would include an obligatory Berthe Morisot in the Impressionism galleries. It was not until this opening, Berthe Morisot, Woman Impressionist, at the DMA that I began to really appreciate her work. My personal collection of art contains many female artists prompted by visiting my favorite gallery early in my career, Dallas Women’s Co-op which included many female artists whose work is owned by museums across the country. Their art does not have a conspicuous gender point of view or style. The early art of Morisot did. While Gustave Caillebotte , who is also found in most museum Impressionist collections, painted male figures dripping with testosterone, like the Floor Scrapers, or in stiff coats and top hats against the backdrop of an iron bridge, Morisot was able to use thick paint and broad strokes to create soft detail with delicacy and refinement. I can laugh at myself for being so attracted to the drab colors and strong simple lines of Caillebotte and overlooking the talent of Morisot because it was too feminine for my taste. This DMA exhibit changed all that. Seeing a succession of galleries filled with her work as it evolved into the last painting exhibited in the show being compared to Edvard Munch gave me a whole new impression of Berthe Morisot. 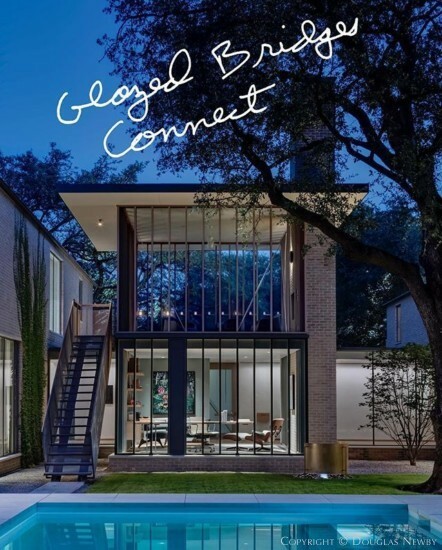 In deference to the substantive live oaks on the property, Max Levy in 2017 broke the floor plan of this modern home into pavilions. Each pavilion threads the trees as does this kitchen with living and dining spaces. 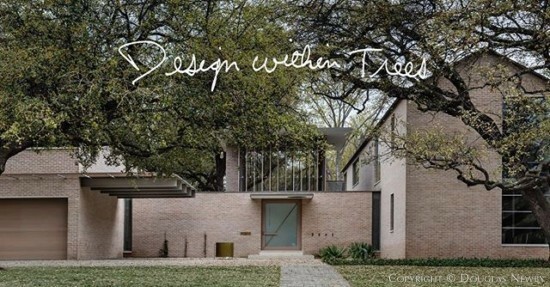 This modern home accentuates the neighborhood concept of parks and trees at at time trees are being torn down faster than houses. Architect Max Levy is a master at connecting separate structures with porches, terraces, breezeways in both his city and country houses. In 2017, he designed a place apart from the main house but still part of the architectural composition. 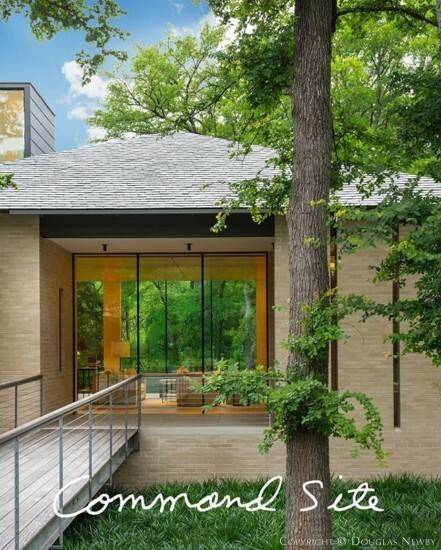 The “sweet spot” of the site amidst the canopies of trees were selected for a second story porch with a fireplace that is only accessible by an outside stairway, separating it from the main house, making it a place apart! Five oaks of strong character command this flat suburban site. Architect Max Levy designed this 7,000 s.f. home in University Park in 2017 to defer to the trees. Acoustical aquatic fountains are dispersed through the site to ameliorate sounds associated with a city and that accentuate a tree-filled site. Turning the harsh Texas sun into an asset is, I think, the defining element of Texas Modern architecture. Good architects in any region are aware of the environment and site when they design a home. In Texas, architects often keep windows on the west side of the home to a minimum and open the house to the east with glass to enjoy the softer sunlight. 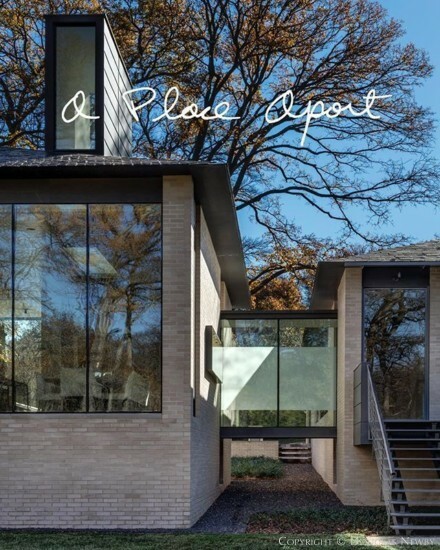 The virtuosity of an architect can be seen when both the east and west façade of the home are glass and the sun is shielded and captured in an enticing way. In this home on Vanguard Way, architect Joshua Nimmo deployed a deep, angled slatted porch to provide shade in the summer and allow the low winter sun to stream all the way across the interior of the home in the winter. Patterns of sunlight and shadow provide visual interest, and on a cold Texas winter day the sun warms the home and the soul. One of the most rewarding opportunities of listing an architecturally significant home like this one is getting to spend time in the home thinking about why the home resonates with me in such a powerful way. 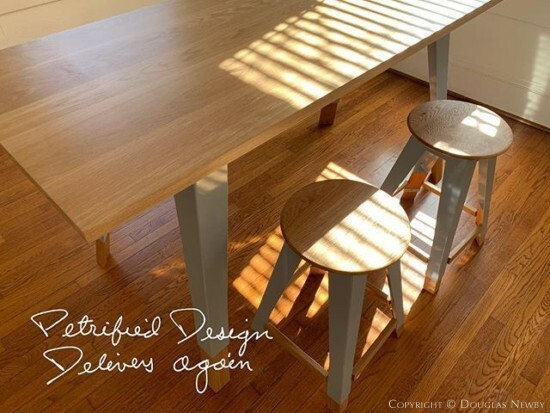 Sometimes it is proportions, or the materials, subtle details, the site, or all of this and more, that contribute to its aesthetic success and to a home that makes one happy. Each distinct pavilion of this home Max Levy designed in 2014 has glazed walls and doors providing views of a site surrounded by trees. The glazed bridges allow uninterrupted views as one traverses from one pavilion of the home to another pavilion of the home. Max Levy connected three pavilions by glazed bridges that step around and through trees. Rather than create a presence on a flat featureless lot, here Max accentuates what a tree-dominated lot gave him. 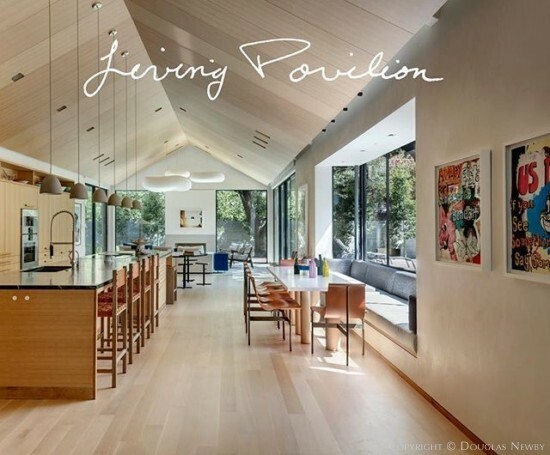 The architectural result was Max Levy creating a home in 2014 people love. Cedar trees dominate this site. No trees were put down. The gently sloping lot was regraded creating the canvas for the Max Levy designed home in 2014. Looking through this house from the inside or outside, one’s view continues into the trees. A kitchen might almost seem superfluous in a house next to the Katy Trail that leads to many of the best chef-owned restaurants in Dallas. 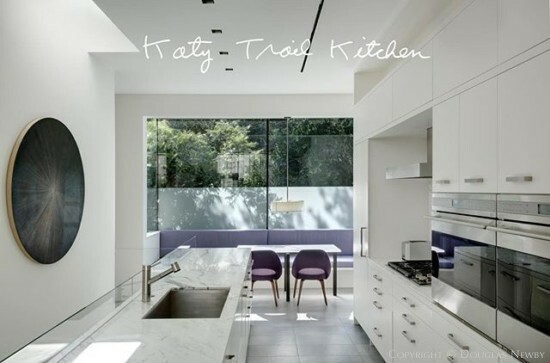 A Max Levy kitchen and breakfast room framed by the nature of the Katy Trail does entice one to stay home. This Northern Heights modern home built in 2012 adds to the collection of architecturally significant homes in Northern Heights. 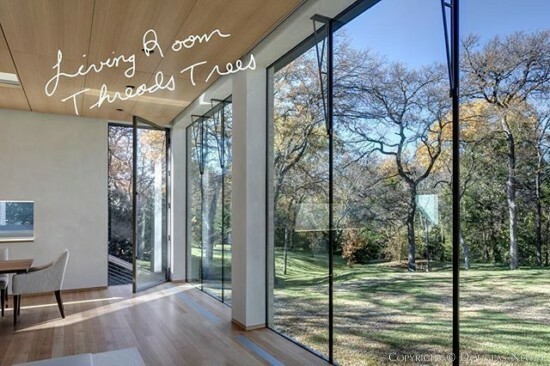 Architect Max Levy designed a linear progression of rooms to give each one views of trees and dense foliage. Proceeding through the floor plan culminates in a screen porch on the second floor. 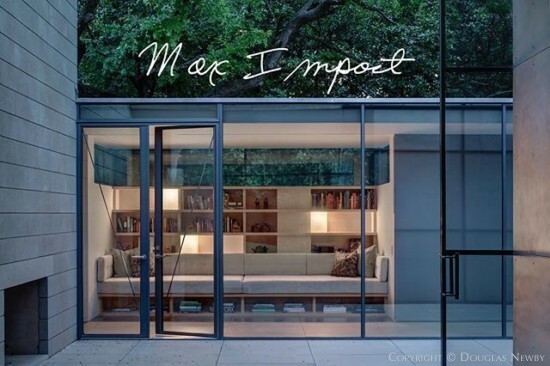 The open and screen porches found in many of Max Levy designed homes, I often think of as the Holy Grail of Max Levy architecture. 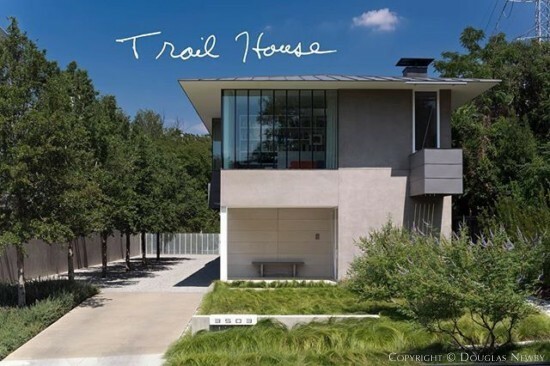 Swaddled by the Katy Trail foliage on one side and an allée of trees on the other side, Max Levy designed this home in 2012 to be immersed in urban nature. Lifting the principal living spaces to the second floor allows the homeowner to look over the trail with a view filtered by the treetops. Northern Heights is the first neighborhood where architects designed award-winning attached single family modern homes. This Max Levy designed single family modern home solidifies the architectural importance and modernity of Northern Heights. Architect Max Levy has always been fascinated and attracted to the endless open spaces of the Texas prairie. This penthouse is in such an interesting location. It is right in the heart of a vibrant urban neighborhood of restaurants, bars, galleries, offices, and apartments, but just far enough from the dense cluster of downtown high-rises to create a visual plateau that extends from the extraordinarily deep and wide terraces of The Centrum. 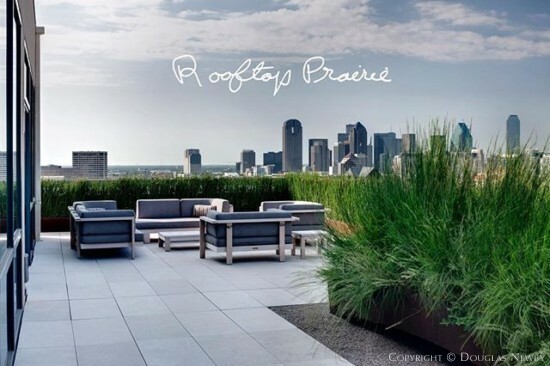 The rooftop is planted with prairie grasses which further creates the illusion of endless uninterrupted space looking into the horizon. Translucent partitions is another way architect Max Levy diffuses and directs light. In this downtown Dallas penthouse, Max has deployed translucent partitions throughout the penthouse, creating definition and privacy for specific rooms and spaces while maintaining the open floor plan and light-filled residence. 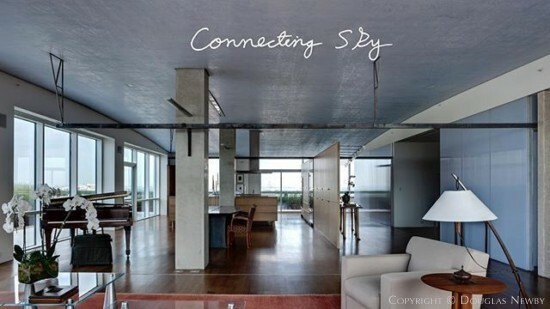 Max Levy connected the sky with an arced blue plaster ceiling of this Dallas penthouse. Max Levy also in 2010 connected a tired building from the 1980’s, often ignored, to the imagination of those in Dallas. The merits and desirability of the building with its massive terraces and balconies was rediscovered when the penthouse of The Centrum became an architecturally significant residence surrounded by a vibrant downtown neighborhood. 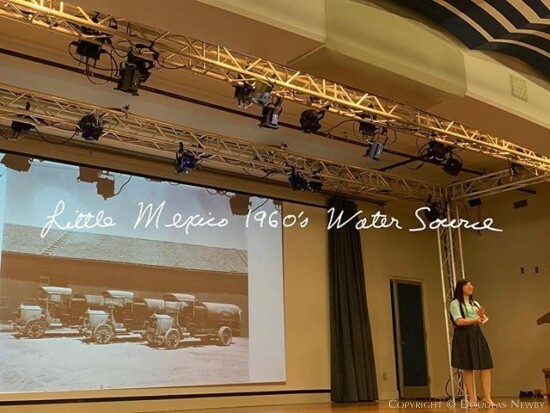 Priscilla Escobedo, archivist at the Dallas library, presented at the Legacies Dallas History Conference in the Hall of State, a talk on how water was delivered first by mule-drawn water wagons and then by water trucks to Little Mexico well into the 1960s. This was not just drinking water—this was water for all household needs as there was no indoor plumbing. Even those with backyard wells risked being contaminated by the outhouses next to them. Priscilla Escobedo has done incredible research on these neighborhoods where little published information exists except for Sanborn fire maps showing water sources from creeks in Dallas. She was very cute when she said to an audience predominantly born in the 1940s and 1950s that she did not know how many of the audience might have been born by the 1960s but the 1960s was not that long ago. She made the point we had put a man on the moon by the 1960s when Little Mexico and parts of West Dallas had no piped-in municipal water. 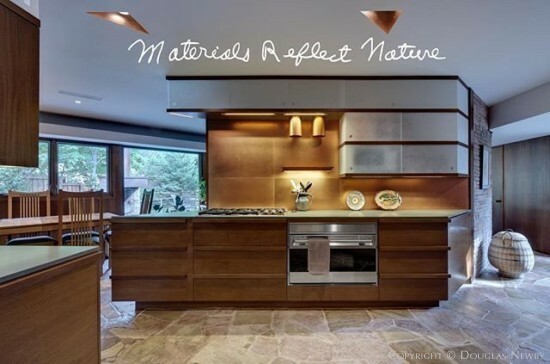 materials inside the house reflecting the materials on the exterior of the home and nature, along with continuing the sleek horizontal lines inside the home suggests the architecture of Max Levy. Max Levy designed the renovation and extension of the home in 2005.
creek lot. 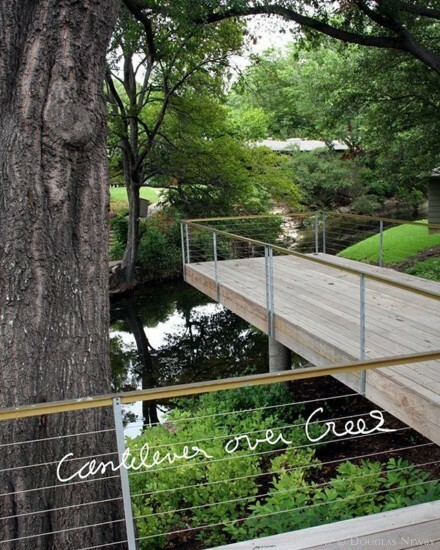 Decks were cantilevered over the creek to draw in nature and project the home into nature. Interest continues to grow in the northwest Dallas 1950’s neighborhoods. Architect Max Levy contributed to this surge in renovation and new modern homes in this neighborhood when he renovated and extended this vaguely Wrightian styled home originally built in 1955. For an older neighborhood to gain traction, with a new audience of homeowners, it is important that renovation and new construction makes a positive impact on the neighborhood. Max Levy did that in two ways with this home. Aesthetically, the home, unlike the homes around it, is still a good neighbor with its surrounding homes. 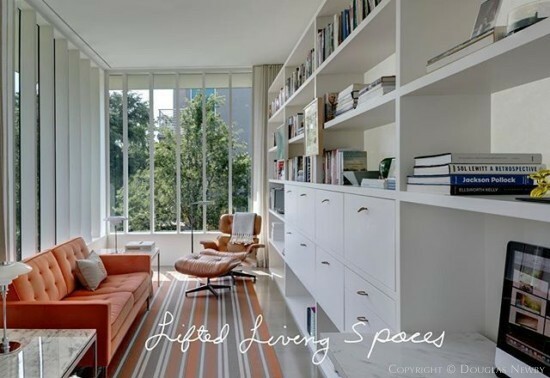 The home also conveys architectural significance, a home of importance creating confidence in the neighborhood. 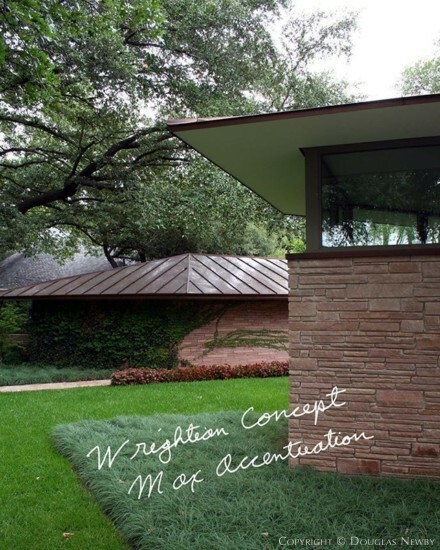 Max Levy accentuated and enhanced the Wrightian concept of the home to become a Max Levy designed home.